Created by John Wagner, Brian Bolland. A series of incidents forced Anderson to re-assess her belief in Mega-City One's justice system. After striking Judge Goon she was sent to Mars on probation, where she met a race of aliens who were instrumental in the evolution of humanity. Having destroyed these "gods", she resigned from the Judges and went on a personal odyssey across the galaxy. Visions of an imminent catastrophe threatening MC-1 drew her back home where Anderson proved her loyalty by defending the city against an immensely powerful being calling itself Satan. 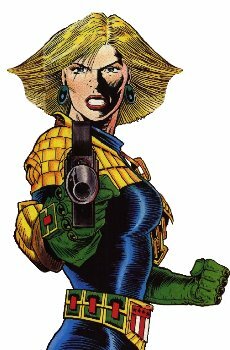 She recently had a near death experience after putting herself in harm's way to save the children of Mega-City One. Cassandra is now fully fit, but is she truly ready for the brutal realities of being a Psi-Judge?